It's a known fact that everything is better lit up and sparkly. Case in point? The Eiffel Tower. And birthday cakes, of course! But can the same be said for our nails? The answer is yes actually, if this super sparkly set is anything to go by. Meet: LED disco nails, the lit new mani set to take over your talons - and your Instagram. Cast your minds back for a minute to when Kim Kardashian experimented with an (albeit brief) 'edgy' phrase. I'm talking about when she single handedly tried to style poppered trackies with heels, AND bring pierced nails back into today's fashion sphere. Now, while the former look was a resounding thumbs down (sorry Kim) the latter had us all divided - some were firmly in the Regina George 'stop trying to make pierced nails happen Kim, it's not going to happen' camp, while the rest of us were actually kinda digging it. But whether you were a fan of Kimmy's pierced nail look or not, this studded set will definitely sway you. Meet pierced *disco* nails, the sparkly manicure literally lighting up our lives and coming to a dance floor near you. The glowing set is the beauty brainchild of Park Eunkyung, a creative nail technician and founder of LA based nail parlour 'Unistellar', who by the way, if you're not already following on Instagram then you should be STAT, you'll thank us later. The look is achieved by applying a long plain acrylic to the nail in the traditional way, then literally piercing the LED light (which looks a bit like a stud earring) through the top, before tightening it in place and you're done. The lights play in sequence too which we think makes this mani all the more cooler. All that's left to do is watch as the admirers flock to your fingernails. I know I'm months premature here but how amazing would this set look at your work's Christmas 'do? It would certainly give everyone something new to talk about rather than hearing the story about how John from HR got his mum a pet Lama for Christmas in 2009 and he lived to regret it, because it ate his reindeer tie. 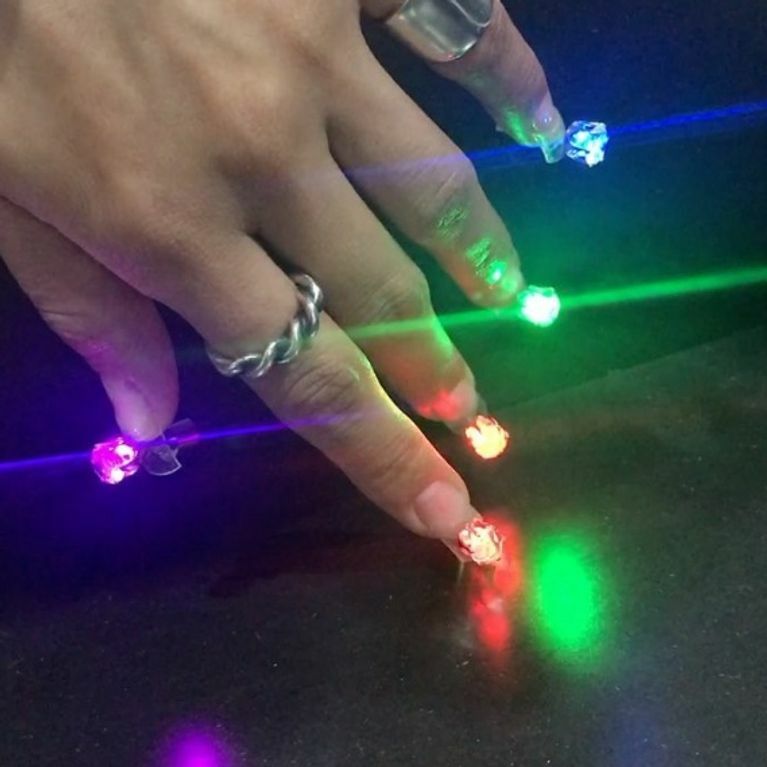 Would you ever try pierced LED nails? Let us know your thoughts @SoFeminineUK!